All orders are subject to availability. Packages are shipped via the United States Post Office, nonetheless, we reserve the right to ship by other carriers. We can not ship on weekends, or holidays. We are able to ship to P.O. Boxes. Guitar Principles, Inc. expressly reserves the right to refuse to conduct business with any third party. Guitar Principles, Inc. accepts the following forms of payment: Business or personal check (from USA bank accounts only), money order, and credit card (Visa/MC/AmEx). Guitar Principles, Inc. features secure online ordering by credit card. Guitar Principles, Inc. accepts money orders denominated only in United States Dollars in connection with all orders. To pay by check, or money order please select "Order by Mail” on the Order page. All international mail orders must include one of the following forms of payment: International Money Order in US Dollars, or Visa/MC/AmEx credit card information. Any other form of payment will be denied, and your order will not be filled. Returned checks will be subject to the maximum returned check fee allowed by law. Paying by check will delay your order, as Guitar Principles, Inc. does not process or ship your items until your funds clear. Payment by check typically delays your order 2 weeks. Starter checks are not accepted. All prices may be subject to change without notice. Guitar Principles, Inc. will make every attempt to ship all orders within 48 hours upon receipt of your online order. Delays may occur due to circumstances beyond our control. You will be notified by email should there be any problem or delay with your order. Handling fees (shipping supplies, gas, labor) are included in the price of shipping. The Standard Shipping method is USPS Media Mail and offers 7-10 business day delivery throughout the 50 United States and Puerto Rico, depending upon your location. Expedited Shipping is by USPS Priority Mail and offers 3-5 business day delivery. There is no tracking confirmation available with these services. Please contact us, and include your zip code if tracking is required, and we will email a price quote for the additional service charges. Guitar Principles, Inc. will send an e-mail confirmation upon shipment of your order, providing that you have provided a valid email address. We will not be responsible for notification of your order should we receive email notification returned to us as "Undeliverable". All orders shipped anywhere in the State of Nevada are subject to the current State of Nevada sales tax. (8.1%) sales tax to Nevada residents, only. All other locations are exempt as by law. We ship most packages within 48 hours of receipt of your order via Air Mail delivery. Standard Shipping is 10-14 business days delivery from the date of shipment. Expedited shipping is 5-7 business days and packages are sent USPS Express Mail International Delivery. We will notify you by email the day your package is shipped, along with the tracking number. You may receive a phone call from your customs office to appear to open and sign for your package, but in any case, a signature is required for Expedited Service at delivery, so please be available to do so. Delays may be experienced during holidays and wartime, as well as by your local customs office for their security issues. Any duties and or taxes imposed by your country are your sole responsibility to pay. Guitar Principles, Inc. reserves the right to refuse shipment to any country, including those to which the U.S. has embargoed goods, any country on the U.S. Treasury Department's list of specially Designated Nationals, and any country listed on the U.S. Commerce Department's Table of Deny Orders. On international shipments there is a strong likelihood that your packages will be subject to the customs fees and import duties of the country to which you have your packages sent and may be subject to import duties and taxes, which are levied once the package reaches your country. Additional charges for customs clearance must be borne by you. Guitar Principles, Inc. has no control over these charges, does not receive any money for these fees, and cannot predict what they may be. It is your country that is imposing the fees and/or taxes. Customs policies vary widely from country to country; you should contact your local customs office if you have questions, for further information. 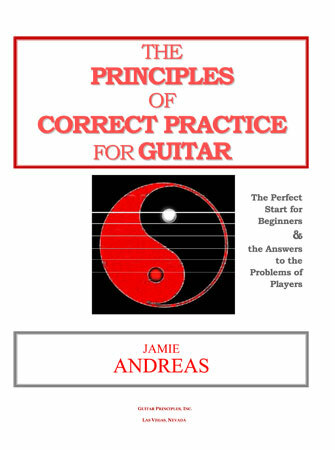 Additionally, when ordering from Guitar Principles, Inc., you are considered the importer of record and must comply with all laws and regulations of the country in which you are receiving the goods. Please enclose a printed copy of your order along with your payment. All mail orders are shipped within 48 hours of receipt when payment has been remitted by BANK or POSTAL MONEY ORDER. Personal and business checks are accepted from the U.S.A. only. Paying by check will delay your order, as Guitar Principles, Inc. does not process or ship your items until your funds clear. Payment by check typically delays your order 2 weeks. Returned checks will be subject to the maximum returned check fee allowed by law. Starter checks are not accepted. For International Mail Orders, enclose an International Money Order from your Post Office, or Bank in U.S. Dollars. Any other form of payment will be denied, and your order will not be filled. Used merchandise may not be returned. If you have ordered the incorrect item, please return in the original condition; shrink-wrapped products must be unopened. Books must be in new condition. Guitar Principles, Inc. has the right to reject any product for a refund if the condition of the product is damaged, or it appears to have been used by the customer. We have offered extensive descriptions about each product on our shopping cart and on the website. Please consider your selections carefully. If you have any additional questions about a specific instructional book or DVD, please contact customerservice@guitarprinciples.com before your purchase. For your protection, we recommend that you use USPS insured, return receipt requested. Include the packing slip with your return, and wrap the package securely. Guitar Principles, Inc. is not responsible for any costs of shipping and handling on returned items. Any shipping and handling costs charged on your order will be deducted from your refund. We will issue a refund to your original form of payment for items returned within 14 days. Guitar Principles, Inc. will notify you via e-mail of your refund once we have received and processed the returned item. Please note: Shipping charges are non-refundable. UNDER NO CIRCUMSTANCES are we able to accept returns or refund downloadable PDFs, gift cards, and shrink-wrapped items that have been opened. Subject to availability, exact exchanges will be made only on damaged or defective products. Although rare, if the shipping envelope or box is visibly damaged upon receipt, refuse to accept it and immediately notify us by email at customerservice@guitarprinciples.com of your refusal to accept the order. Claims must be made within 5 business days of your receipt of an order.